Betty Jane (Neal) Allbright, 80, of Holly Pond, passed away Monday, December 31, 2018. She was born March 23, 1938, to Raymond and Orene Scott Neal. Betty was a devoted wife and mother. She enjoyed caring for her family and making home a warm and inviting place for them all. She adored her grandchildren! Betty loved watching the grandchildren play ball, rarely missing a game. She also loved to travel, shop, and cook. She was always going, often times outdoing her children and grandchildren with her energy. Betty was a special lady and her absence will be felt by many. Mrs. Allbright is preceded in death by her parents; brother, Harvey Neal; son, Tommy Allbright; and beloved husband, Festus Allbright. Betty is survived by daughters, Phyllis (David) Thomas, Terri (Kevin) Caldwell; grandchildren, Chad Allbright, Chris Allred, Jessica Allred, Jason Thomas, Heath (Breann) Allbright; great-grandchildren, Cade Allbright, Lily Allbright, Olivia Allbright, Uriah Allbright, and Arri Allbright. Funeral services are 1 p.m., Thursday, January 3, 2019, at Pleasant View Baptist Church, Pastor Randy Burtram officiating. 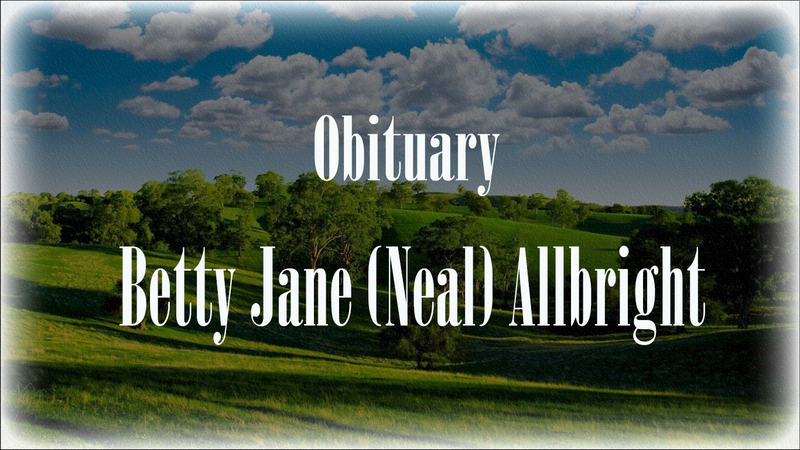 Mrs. Allbright will lie in state from noon until services begin at 1 p.m. Burial will follow in Holly Pond Cemetery. Friends may visit with the family in the Holly Pond Funeral Home chapel on Wednesday, January 2, 2019, from 6 p.m. until 8 p.m.
Holly Pond Funeral Home is honored to serve the Allbright family.